Epic. That's the best word I can use to describe Star Wars in Concert. As I write this, the show ended about and hour and a half ago. What an amazing show! 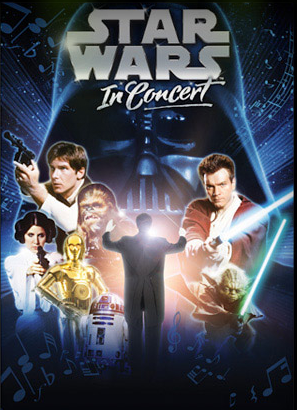 For those who aren't aware, Star Wars in Concert is a travelling show consisting of a 86-piece orchestra, a huge choir, lasers, lights, the live narration of Anthony Daniels (a.k.a. C-3PO), and a 100-foot high-definition screen displaying clips from all six films synchronized to the music. To call it a fun and unique experience would be an understatement. Read my full review after the jump. The show appropriately began with the THX sound and 20th Century Fox Fanfare followed by the words, "A long time ago in a galaxy far, far away." Naturally the Star Wars Main Title came next, with the iconic yellow letters fading into the distance. It was a majestic opening to an incredible evening. After the music ended, the voice of Darth Vader introduced Anthony Daniels, who took the stage and set the scene for a re-telling of the Star Wars saga through the music of John Williams. The show was broken into segments that reflected major themes and events from the films, with each segment being introduced by Daniels. His commentary was generally direct and to-the-point, but there were some moments of levity. First, before a segment about droids, Daniels got carried away in extolling the wonders of C-3PO, which prompted conductor Dirk Brosse turned and shot him a disapproving look, at which point he stopped mid-sentence and said "right....anyway...." before continuing. It was clearly scripted, but still hilarious. Another fun piece of narration came when Daniels opened his tuxedo jacket to reveal a gold vest and slipped into the character of C-3PO, saying that the chances of survival were 3,720 to 1. He added that some people prefer never to be told the odds. Fanboys all throughout the arena laughed and cheered. The music was, of course, exquisite. Some of the best musical moments from all six films were represented. The orchestra and choir sounded absolutely perfect. At times, I forgot that I was listening to a live performance. It really sounded that tight. The music cues were perfectly synchronized with scene changes and cuts in the video on the gorgeous screen above the orchestra. It was done freakishly well. The thought of performing this show every night, sometimes more than once a day, and executing it so perfectly every time is absolutely mind-boggling. This was a totally unique experience. I've never seen anything quite like it before, and I don't know if I ever will again. The audience absolutely loved it. People of literally all ages smiled, laughed, and genuinely enjoyed themselves. The music was superb and the lights and video were beautiful. It was something really special. I really applaud George Lucas for allowing this wonderful show to take place. 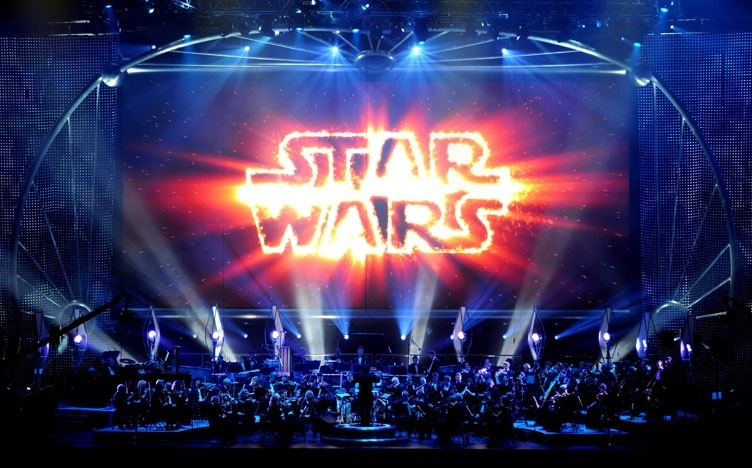 It brought people together to celebrate the amazing music of Star Wars. Star Wars in Concert was an evening of pure gold. I heard my favorite pieces of music from my favorite film saga performed live by an incredible orchestra and choir, along with video clips from said saga, narrated by a supremely talented actor who was a part of every film from said saga. Could I have possibly asked for anything more? There was even an encore! My only complaint about the show was that I had so much fun, the night just flew by. Including a 20-minute intermission, the concert clocked in just under 2 hours, but it felt like almost half of that. So do yourself a favor and see this show if you can! Find out if there's a performance in your area and see if tickets are available. You'd be surprised how tickets become available even days before a show. You never know until you try! And you'll be glad you did! May the force be with you! Who thought someone could take the 1966 Adam West Batman film and actually make it look epic? I know I didn't. Oh well. "Some days you just can't get rid of a bomb." Very cool! Free download of a great McCartney song recently featured in the Adam Sandler / Seth Rogen comedy Funny People. What Would I Look Like As A Vulcan?